We are so happy about the bounty that the garden supplied us with this week. This week’s share is pretty huge! It may be a good week to host some company to help you work through your wonderful produce, one bite at a time. bulb to tender leaf. Thinly shaved, (on a kitchen mandolin, or if you’re skilled, a sharp knife) they are excellent in a salad with a citrus dressing. Roasting or even caramelizing them is perfect for a more robust meal, especially Italian inspired dishes. 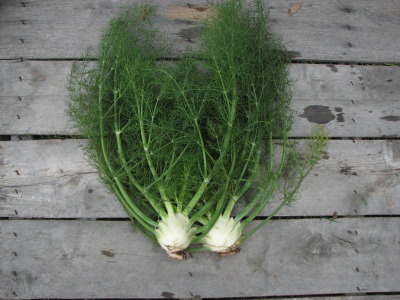 Stems are great to use as a flavoring in pasta sauces or soups, and the more tender of the frilly leaves are great as a fresh herb as well. This is seriously a special treat. I am excited to see what you do with yours! Broccoli—Large shares received a few petite heads or several florets. Fresh from the field broccoli has an excellent flavor. You don’t need any tips from me on this one. Enjoy! Swiss Chard—Small shares received this item. The leaves are very similar in flavor and texture to mature spinach and are great raw, braised, or sauteed. This crop was used at the Farm Dinner this weekend in a wonderful massaged chard salad with arugula and dried cherries. We will post the recipe next week! Lettuce—Large and small shares each received tropicana- a green and crisp variety- and new red fire- red on the outside and lime green on the inside. This one is particularly gorgeous and delicious. romaine lettuce (we sent it out to you last week), and purple. These are round and grow in a small baseball-sized head with softer outer leaves. Some of the outer leaves die back whenever the crop is ready to harvest. We removed most of them, but as you peel away the leaves, you may find some brown leaves. This is normal. Just pick them off and wash it under cold water. 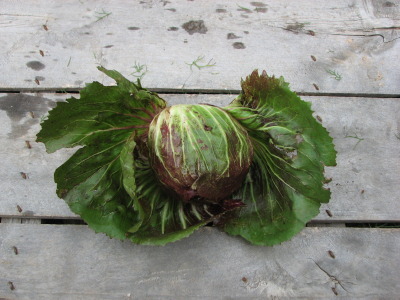 Radicchio can be used in a salad, but the best way to enjoy it is grilled! Clean well, and quarter from the root, keeping the leaves intact. Brush the inside and outside with olive oil and sprinkle with salt, black pepper, and any spices of your choosing. Grill until a little wilted and the edges are just a bit charred. Kale—Large shares received Red Russian kale. This is for sure our favorite variety. Too tender to be grown commercially for grocery store shelves, you can really only find this one at fresh and local farm markets or straight from your farmer. Try one of our many kale recipes in the kitchen blog. Arugula—Large shares received spicy delicious arugula. Serve in a salad with feta and fresh blueberries. It’s delicious! Asian Spring mix—small shares received our flavorful, colorful Asian spring mix. This harvest came from a fresh, new planting so the leaves are very young and tender. I would recommend it in a salad this week because of how great the quality is this week, but they would also be great sauteed with any of your other greens like turnip greens or kale. Onions—The onion harvest is complete and they are curing nicely in our pole barn. We are going to hang them all to dry, and it’s a big job. If you want to offer your help and company it’ll be a fun task. Each share received two of our sweet yellow variety and there will be more to come. These are young, still uncured onions, so they should be eaten fresh, and not stored away for days on end. Use within 1-2 weeks. Turnip greens—These small bunches of tender greens are from a thick planting of turnips. They are soft and young and really delicious. It’s a fairly small bunch, so I suggest tossing them in with other greens to fill out a fuller side-item. They would work well with kale or collard, Asian greens or spinach. Definitely cook with butter. Yum! Spinach—Large shares received bags of fresh young spinach. We have always had a really rough time growing spinach out here at Red Moon Farm, and after 3 years of attempts, we are thrilled to finally have some for harvest. We don’t have a lot, but we are glad you at least get a taste. Savor it! 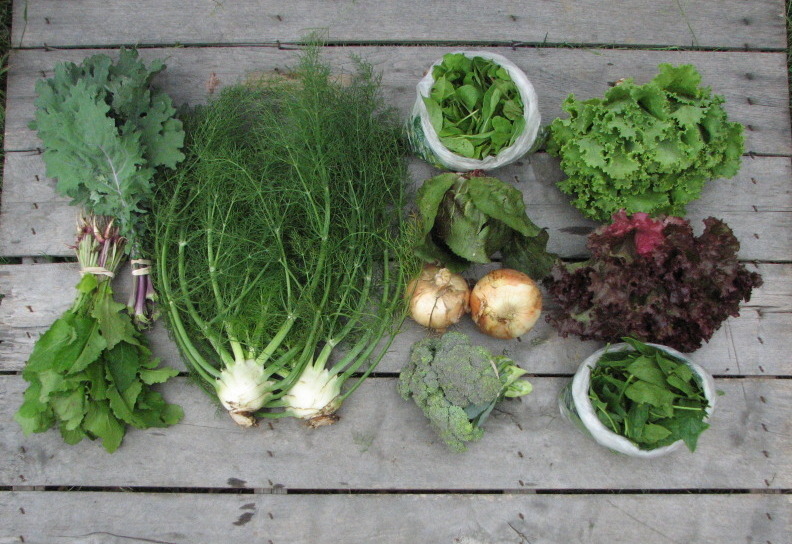 Large Share (by columns from left): Turnip greens, kale, fennel, arugula, radicchio, sweet yellow onions, broccoli, tropicana lettuce, new red fire lettuce, and spinach. 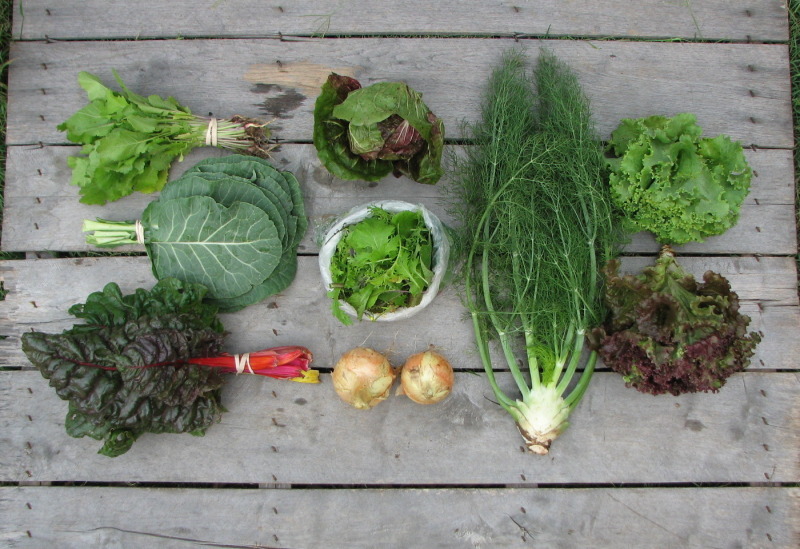 Small share (by columns from left): Turnip greens, collard, Swiss chard, radicchio, Asian spring mix, sweet yellow onions, fennel, tropicana lettuce, and new red fire lettuce. Everything is incredible! But…the BROCCOLI! WOW! Delicious! Thank you, Courtney! We were really pleased with all the garden supplied this week! Chicken, apples, and fennel! (recipe from wellnessmama.com) So good. We are loving these boxes of fresh veggies.